Home > Latest News > Job Hunting > How to look for a job > Will it hurt my Job Search if I don’t use a Cover Letter? Will it hurt my Job Search if I don’t use a Cover Letter? The answer to both is a resounding yes. Yes, you really need a cover letter—and yes, recruiters and employers actually DO read them. Furthermore, it absolutely CAN hurt your resume response rate if you do not use a cover letter. 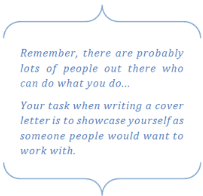 A cover letter is the perfect place to introduce yourself, make a connection with the employer, express your personal interest in the position, and outline why you’re the best candidate who offers the most value to the employer. Address it to a person’s name; research who the hiring manager or decision maker is for the company. This shows you did your research, you know who to contact, and you’ve made the effort. Be upfront and direct; give them three reasons why you’re the best person for the position and why hiring you is a greater benefit to the company than candidates X, Y, and Z. Name drop the person who referred you, state specifically why you’re interested in this role, or make a connection between your personal interest and the position showing the employer why you would add value to their team. What do you know, what information or wisdom do you have that they need? Elaborate on this. Requesting an interview at the end of your cover letter increases your possibility of getting a call for an interview by approximately 50% (I’ve read several different stats about the actual percentage being between 50%-75%, so I’ll go on the conservative side and say it will increase your chances by 50%). I’m not a mathematician, but if there’s a 50% chance they’ll call—and a 50% chance they won’t call you—and then asking for the interview increases the possibility they’ll call you, doesn’t that mean that now there’s a 75% chance they’ll call and only a 25% chance they won’t? I can’t speak for anyone else, but I’d want to up my response rate and results by requesting the interview. We always find a golden nugget of information to include in the cover letter at the very end that guarantees the employer will read it and want to know more. It changes for every client and is completely customized to them—but this little trick ensures this information is always read. We utilize a PS in our cover letters to ensure maximum impact. It is important to note that it is not just about including one—it’s also about what you say in that P.S. And I can guarantee you, we write some unbelievably appealing ones—the kind that cause the employer to pick up the phone and call our clients the exact same day. With all of these wonderful benefits—each of which creates new opportunities in your job search—why wouldn’t you want to utilize a cover letter? It really is a wise decision to use one every time you send out your resume. If you were on the fence about whether you should or shouldn’t use a cover letter, I hope the five advantages I’ve mentioned above were enough to answer any questions you may have had.